Breaking Benjamin is an American rock band founded in 1998 by Benjamin Burnley in Wilkes-Barre, Pennsylvania. Burnley is the sole constant of the band, withstanding multiple line-up changes, and is the primary songwriter and lead vocalist. Most recently he is accompanied by Aaron Bruch (bass), Shaun Foist (drums), Keith Wallen (guitars), and Jasen Rauch (guitars). The band has released four studio albums, Saturate (2002),We Are Not Alone (2004), Phobia (2006), and Dear Agony (2009), with sales exceeding 5 million units in the United States alone. The band will release its fifth studio album following a four-year hiatus, titled Dark Before Dawn on June 23, 2015. Breaking Benjamin has produced two albums that are RIAA-certified platinum (We Are Not Alone and Phobia) and three certified gold (We Are Not Alone, Phobia, and Dear Agony). The 2006 single "Until the End" went platinum in February 2014 as well. 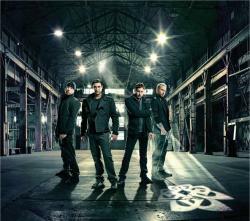 Since signing with Hollywood Records in 2002, Breaking Benjamin has garnered mainstream success, with its debut album Saturate peaking at #2 in the Billboard Heatseekers chart. The following three albums all appeared in the Billboard 200, with We Are Not Alone peaking at #20, Phobia at #2 and Dear Agony at #4, all in the year they were released. Dear Agony and Shallow Bay also reached #1 on the Top Hard Rock Albums chart, the former in 2009, and the latter in 2011, 2012, and 2013. The 2009 single "I Will Not Bow" reached #1 on the Top Rock Songs chart as well.